Fashion in 20the century was vibrant and dynamic, with each decade bringing new trends and styles. Most changes in fashion are related to the bigger cultural, economic, social events in the world. But not many fashion decades were influenced by such a strong and important world event as war. The decades of the 40s divide in two very different periods: during and after the war. 40s. a decade of changes. The beginning of the WW2 has influenced the way people lived, and dressed. 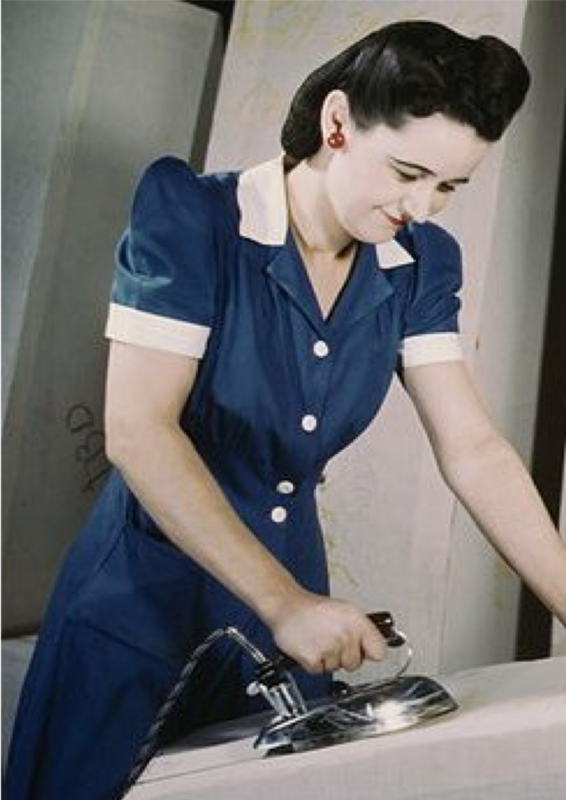 Simpler, more functional outfits were needed as growing number of women entered the workforce, and rationing of materials was introduced by governments. In the US, the government requisitioned all silk supplies, forcing the industry to switch to nylon. In early 40s, even nylon was requisitioned for parachutes, leaving only, the unpopular at the time, cotton and rayon stockings. Clothing was strictly rationed, specifying restrictions for every item, both in Britain and the US. Women’s clothes got a militant masculine look with the invention of shoulder pads that extended the edge of the shoulder. 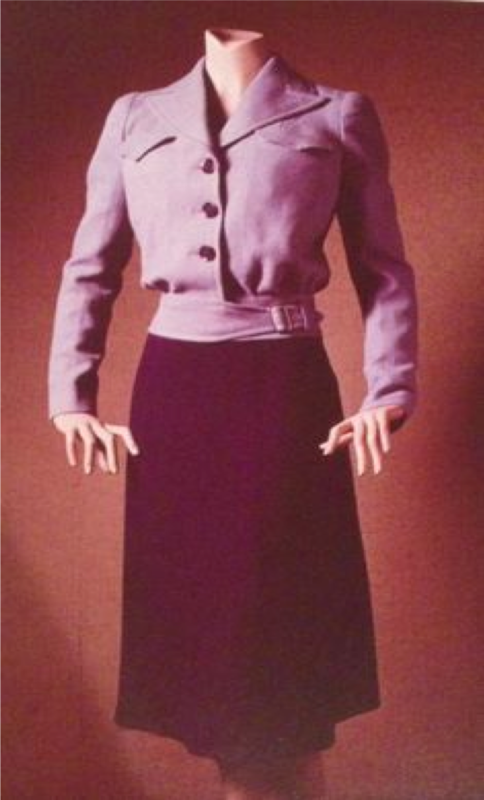 Every dress, top, suit, jacket was fitted with shoulder pads. 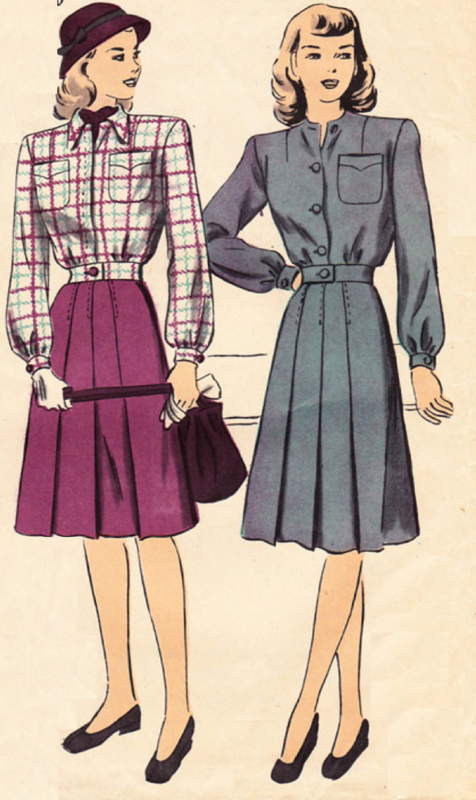 Early 1940s dress styles featured the hour glass figure with padded shoulders, puffed sleeves, menswear style collars, small waist and an A-line skirts to just below the knee. Most women wore skirts at knee-length, with simply-cut blouses or shirts and square-shouldered jackets. 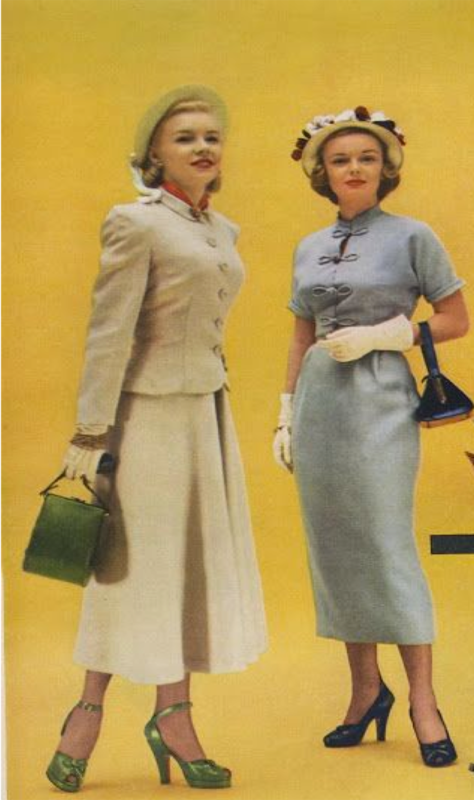 Women were also inspired and remade men's suits into smart outfits. Patriotic colours of navy, red, with primary colours of green, black, grey, and brown dominated most of women’s dresses. 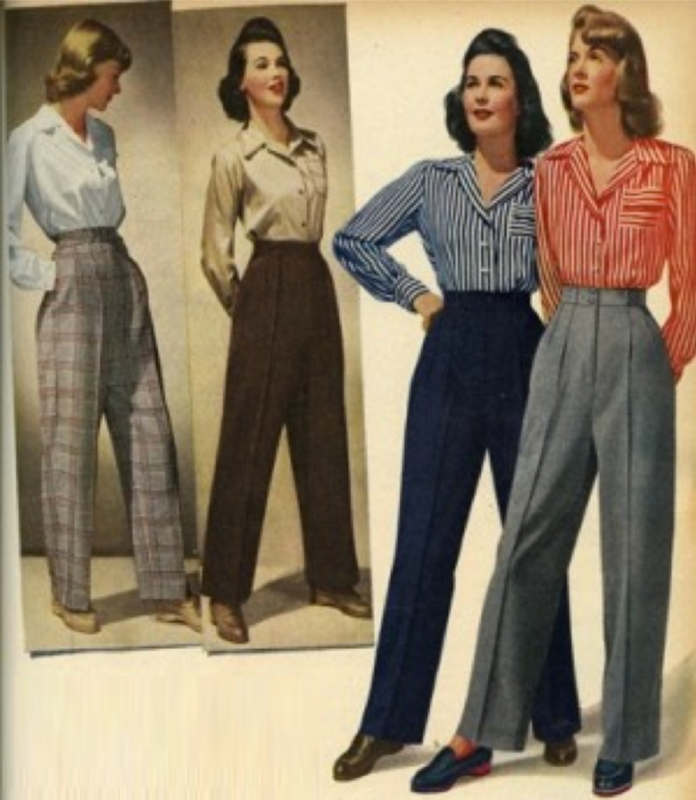 As women entered the workforce, the popularity of trousers skyrocketed. But even they had a similar shape – a small waist, and large A shape legs. Also outerwear was influenced by the military. 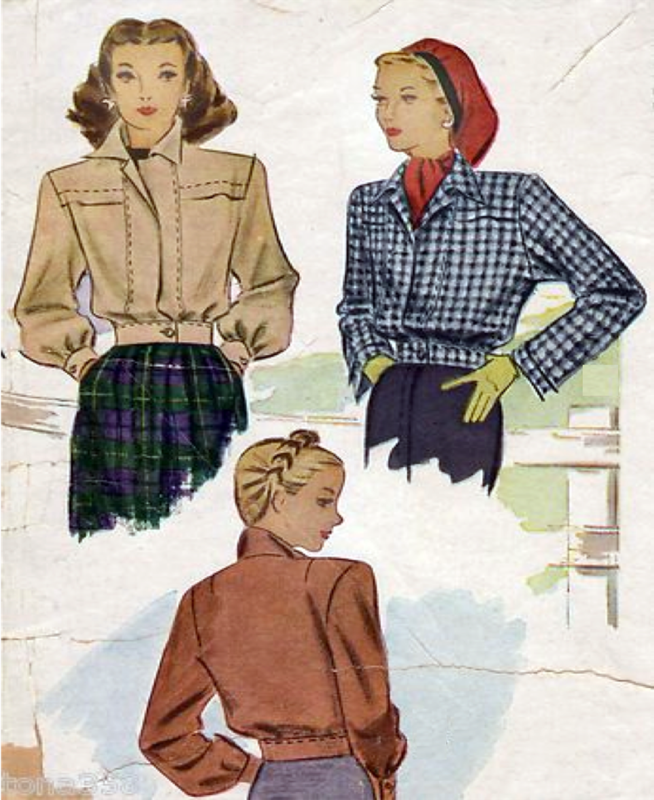 Eisenhower jackets, ]popular in this period, were bloused at the chest and fitted at the waist with a belt to add more feminine look. Freedom of post-war peace inspired important changes. After the war ended and life started to return to normal and women’s clothing became elegant. More fabric choices were available such as linen, cotton, wool, silk and a newer synthetic, rayon. The nylon stockings became very trendy. As colour came back into fashion, women embraced colourful patterns like pastel pink, yellow, blue, purple. The silhouette changed from the masculine back to a more feminine look. Military collars were replaced by round or V necklines. Rounded shoulders, long skirts, hats, high heels started to dictate the trends. 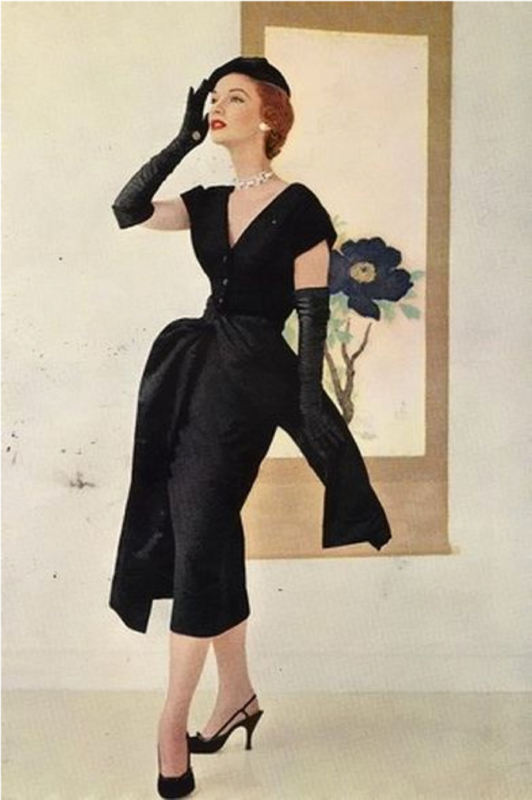 In 1947 Dior’s new collection was introduced to the world. It was said that “the clothes had ‘such a new look’” (Walford) that everyone knew Dior’s style by this name. After the war Dior wanted to turn restriction, rationing, uniforms and give women back the elegance, sophistication, glamour. Dior brought back soft, feminine and decidedly romantic image, inspired by 1910s. 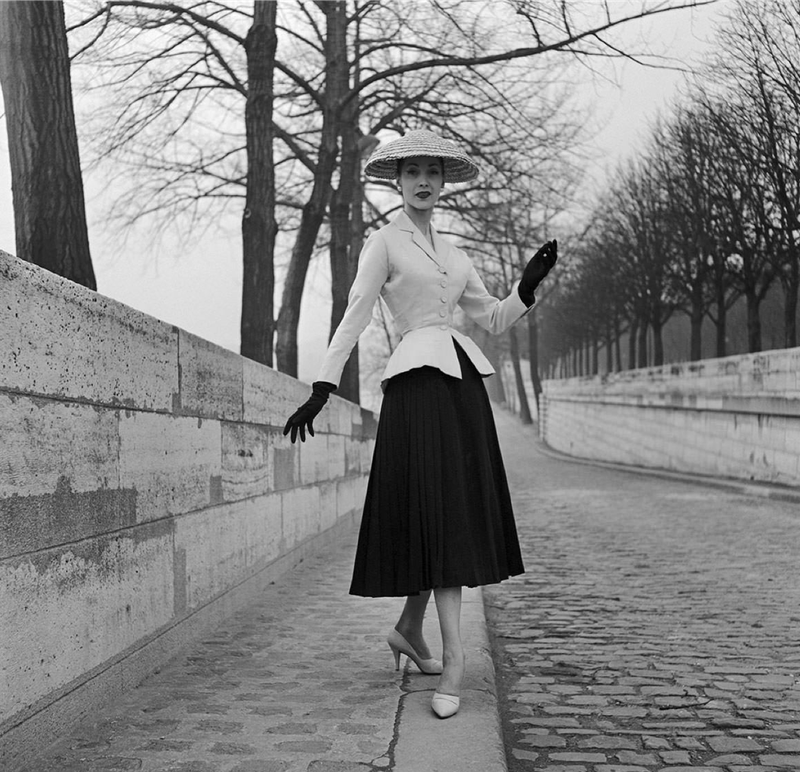 Dior has opened a new chapter in fashion history.